All of our cheeses are made in small, unique batches using both the Grade A goat milk and our Jersey cow milk. 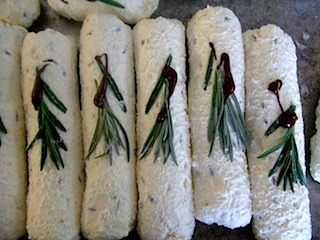 The cheese room produces several flavors of goat cheese commonly referred to as chevre; a soft spreadable cheese, feta, a fresh-pressed cheddar and a buttery havarti. Cheeses made from 100% Jersey cow milk include fresh cream cheese, gouda, cheddar and a havarti. Sweet cream butters made from goat cream, cow cream and one that is a blend of the two are made at various times of the year, typically in the Fall and Winter when the butterfat tends to be higher. 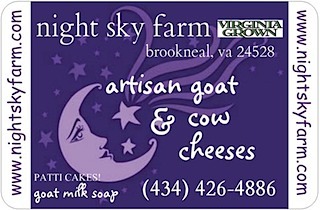 Night Sky Farm has a Bath & Body line too! 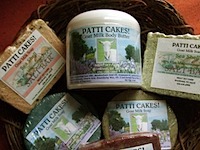 Named after our Saanen doe, Patti, our line is called PATTI CAKES! 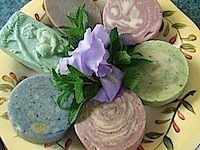 and includes goat milk soap, lotion, body butter and lip balm. 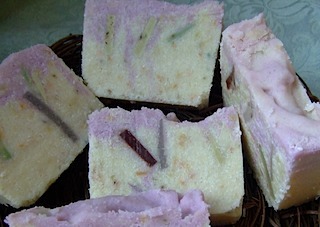 We also make an Eco-Friendly Laundry Soap we call WASH TIME. Our laundry soap contains no detergents or chlorines, is safe for the high efficiency machines because it is low-sudsing and is scented with pure essential oils and blends.